Adorn Milk is a specialized jewelry store for those who love architecture + design, featuring independent and emerging jewelry designers who make architectural, high-quality and handmade accessories. 13&9 is pleased to now be a participating brand with an online shop presented by Adorn Milk. 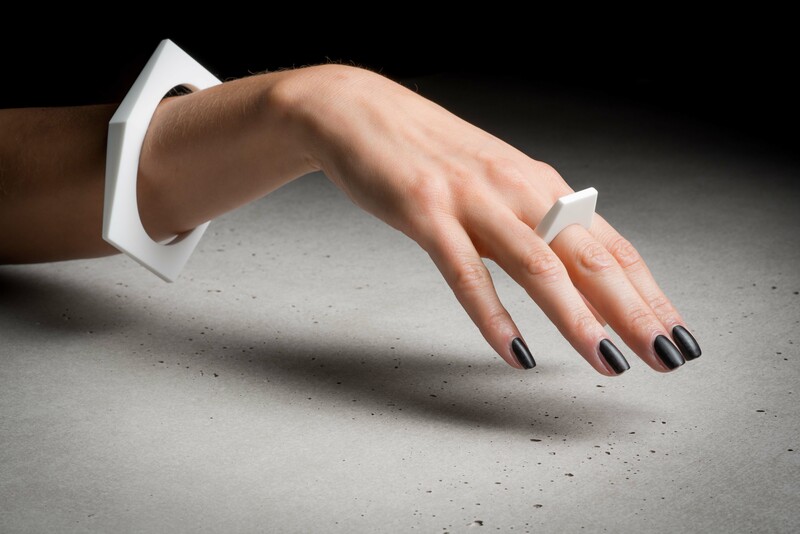 The storefront offers a brand new assortment of GEOMETRIC COLLECTION rings and bracelets that debuted at the LOOT: MAD about Jewelry exhibition at the Museum of Arts and Design in New York City in September 2015. Drawing upon influences from fashion and architecture, these pieces reference the precise geometry of the ellipse and the hexagon. Drafted in CAD programs, the collection relies on design principals used in architecture to create a balanced relationship between surfaces and angels resulting in subtle sculptural forms, including rings and bracelets. The mens’ and women’ collection’s unique appeal is derived from the exceptional use of the high quality architectural material, Corian® that has rarely been used to make fine jewelry.